Simple Ribbon bookmark is a medium heart with a navy ribbon. Choose the pendent and ribbon color. 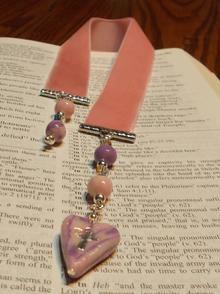 The Elite Ribbon Bookmark is made with your choice of beads at the ends of 1 " velvet ribbon. These are fish hook bookmarks. 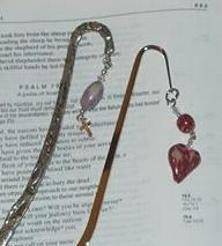 We have the "Blessing hook" and the simple hook in silver or gold. The number and shape of beads is up to you!